I ate one of these cookies before dinner yesterday. It was a cookie appetizer, and it was necessary. Then I made a salad for dinner, ate a truffle santa, and listened to Mariah Carey Fantasy the remix. Just an average night, really. But these cookies are the opposite of average. They are super lemony refreshing! One glance at their casual outfits, you wouldn’t suspect the tasty citrus flavor punch sandwiched in each bite. (Are you into tasty citrus flavor punches? Get ready for it, you guys.) And goodness knows citrus cookies are a welcome addition to Christmas cookie boxes. I may have just decided this fact because I’d love it, but believe it! Preheat the oven to 375°F. In a large bowl, rub the lemon zest into the brown sugar. Beat in the butter, buttermilk, and vanilla with an electric mixer. Mix in remaining cookie ingredients. Shape dough into 1/2 inch balls. On ungreased cookie sheets lined with parchment paper (if you have it) place balls about 2 inches apart. Bake 5-7 minutes or until barely golden brown at the edges. Remove from the oven and allow to cool on the baking sheets for two minutes or until they can be transported easily to a wire rack. When cooled match them up by size. Make lemony filling. Combine brown butter and 2 cups powdered sugar. Mix with an electric mixer until combined. Add zest, cardamom, and a tablespoon of juice. Mix until no longer lumpy. Add remaining powdered sugar 1/4 cup at a time mixing between additions. Add juice as needed until the best consistency for sandwiching. 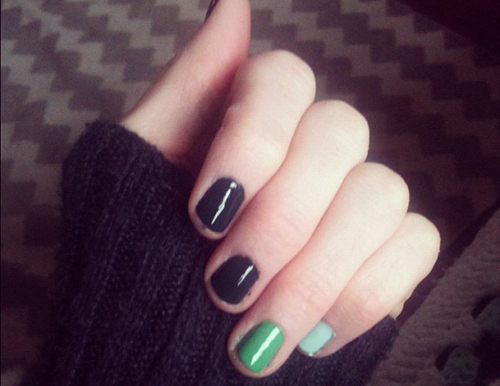 Mustering up holiday cheer 3 shades of green at a time. I’m totally into tasty citrus punches. and I’m totally into these cookies. Let’s eat punches, ya know? way to punch up the citrus AND the holiday cheer, ha! Punchin’ it up … one cookie and one nail polish at a time. 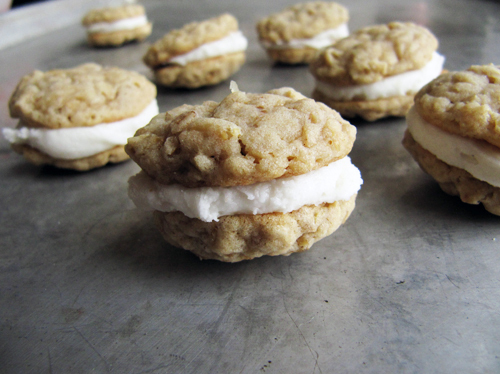 Ohh I love sandwiching things in between oatmeal cookies, so good! Yes! For realz. Ice cream in these guys is super good too! perhaps another way to get into the holiday spirit is a quick, simple swap of mariah – fantasy remix for mariah – all i want for christmas! Oh Robyn! You totally get it. That might be the just easy breezy transition I need. Holy delish! 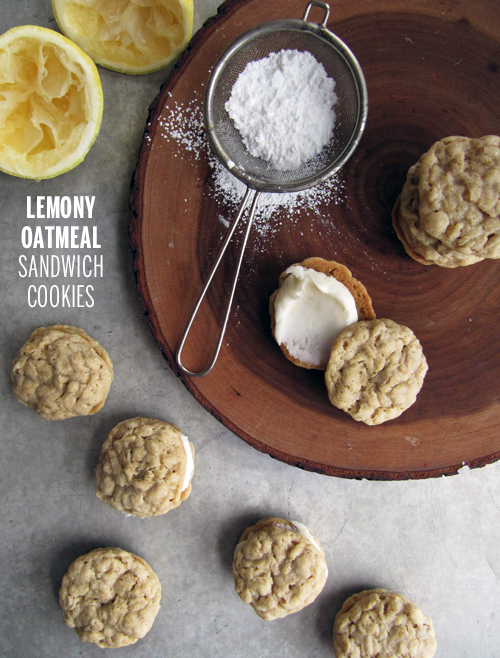 I hardly ever make sandwich cookies because they are usually chocolate and remind me too much of oreos (which like are fun to make but there’s something about the storebought kind…), but I totally love the oatmeal/lemon twist! Great idea! 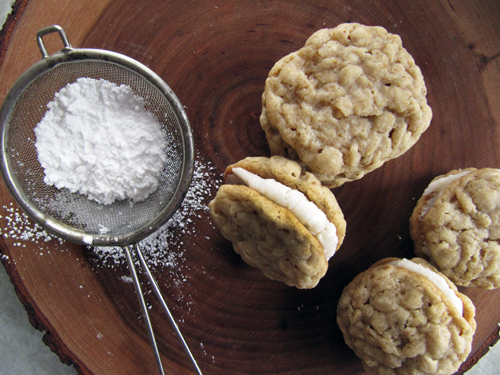 I love oatmeal cookies and yours look so chewy and texture-filled and perfect! The filling if just a bonus! This looks awesomee. I love lemon flavored cookies! I’m extremely new to baking and relatively new to cooking in general – I made these tonight and they turned out lovely…even if I did burn the brown butter a little and even if my cookies didn’t flatten out very well. Does anyone know why that might have happened? They didn’t get near as flat as the pictures at all. I’m sure I must have done something silly.